Copyright �2010 PopEntertainment.com. All rights reserved. Posted: February 12, 2010. 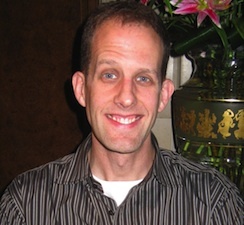 When Pete Docter, director of the Oscar-nominated animated film Up, was coming to New York City to accept an award, I got an e-mail letting me know about it: "Would you like to interview him?" Hell, yeah! Though this year has been great for animated films, with Fantastic Mr. Fox and Coraline providing innovations in stop-motion, and Disney doing a bouncy return to traditional animation, Up provided the ideal blend of a child's sense of wonder and a snarly, craggy version of adult power struggles. As a result it got nominated, but not for Best Animated Feature � it's among the nominees for Best Picture! 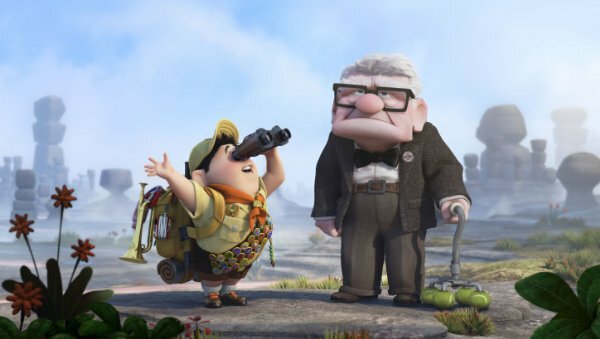 The feature-length film tells of the young Carl Fredrickson, who idolizes the international renowned adventurer Charles Muntz. Through this worship meets a similarly spirited young girl Ellie and they become friends. When Muntz falls from grace, accused of faking his great find � the skeleton of the Paradise Falls monster � Muntz travels to South America in a blimp, supposed to prove the beast was alive but is never seen again. Eventually Carl and Ellie grow up and marry. Though they promise to travel together to that lost land and build a house there, distractions set in and 70 years later, Ellie dies. The lonely, grieving, childless Carl (now voiced by Ed Asner) refuses to move from the house they shared despite generous offers from a construction company that wants to tear it down. When Carl accidentally hits a worker who damaged his mailbox, he is forced to move to a retirement home. He decides to fulfill his promise to Ellie, and uses a plethora of balloons to float the house away in order to travel to Paradise Falls. However he has a stowaway. Eight-year-old Russell � who is trying to get his merit badge assisting the elderly � is hidden aboard. The two escape and travel to strange lands where they meet talking dogs, the now-crazed Muntz and a rare bird named Kevin. Docter, the 41-year-old Bloomington, Minnesota native, has been at Pixar Animation Studios for 20 years, working on the story and as head of animation for the groundbreaking CGI feature Toy Story (1995). He went on to help craft the story for the 1999 sequel; to direct Monsters, Inc. (2001); and to co-write the story for WALL-E (2008). Docter's been nominated for three Academy Awards, and has twice won the animation field's top honor, the Annie Award. Meeting Docter and his producer Jonas Rivera offered one of those rare moments � shall we say an Up moment � to discuss in some detail his long career in a unique medium at a unique time in its history, a time that bodes well for both narrative and technological innovations. This story was a little odd. With Monsters, Inc., I remember being in the shower and thinking, �Say, we could do something with monsters that live in the closet and scare kids� and �why did they do that. It�s either entertainment for them or it�s the job for some.� It all extrapolated out from that concept. This one came from basically the idea of getting away from everything. The way I would explain it was everybody has a point at which they just feel like the world is too much, I just want to escape from everywhere and everybody. That�s what kind of started the movie. Of course it evolved and developed beyond that, and it doesn�t really have that much to do with getting away from the world. It�s more of a connection to his wife, which develops maybe six months into the story workings. It's a curious storytelling process here. You have one idea and you take it along one path with the Ed Asner character and his wife. Then you add in the little kid and all he�s dealing with. Then you bring these two elements together. Then the house launches. You played out this one path, then you throw in something else, and somehow they integrate. It�s amazing how that works. That�s the tricky part for sure. We started with the house flying and then we worked backwards to figure out; who is this guy? Where is he going? Why is he flying a house as opposed to just taking an airplane like a normal guy? And why specifically this place? We really tried to think through logically and emotionally � sometimes those are at odds and sometimes they�re going the same way � what is it about all these elements that work towards the central theme of the film? Really what happens in the first couple of months when you look back, a lot of the key elements are established very quickly, but you don�t really know because there�s a bunch of other things that get thrown out and other things that get added in. From there it�s just a matter of working those pieces and massaging them so they all work together. How did it get written, evolve and how did you decide the twists and turns? It started from a drawing. Bob Peterson and I � Bob being the co-writer and co-director � we just sat in a room and thought of ideas we�d love to play around with. An old man, especially a grouchy old man with a lot of attitude and passion, you know where he�s coming from. He�s going to state his opinion whether it�s popular or not, just like my grandfather. That just seemed like a great place to start for a character. A lot of times we end up � and a lot of people do � with this sort of bland protagonist disease where the lead character is just this milquetoast guy; you don�t want to do anything too nasty because it will turn the audience off or something. With Carl you could sort of get away with a certain amount of attitude because you give him leeway; he�s an old man, he�s allowed to be grouchy. So we played with that. The other thing that contributed heavily was the house floating away. That really went back to some feeling that I think everybody has, but I certainly did directing Monsters, Inc.; directing is such an interactive, people-centric thing, and by the end of the day I�m an introvert. I�d want to go crawl under my desk and just hide and rock by myself for a little while, so floating away from everything just seemed appealing. So we combined those and worked backwards and forward as to why is this guy going? Where is he going? Answering those questions. Where the hell did you come up with the talking dog? Actually the question really is how do you buy into the story? Because anybody can come up with these weird ideas, and the beginning versions of this story were a little bit of a grab bag of cool things that we just thought would be fun. They were, but the difficulty in making these stories is connecting them all; weaving those threads together so that this is a story that makes sense to have talking dogs. Hopefully we did that and you�re sort of brought in by Muntz, who�s kind of the opposite of Carl. So this is the logic: Carl never actually got to go on this real adventure, to travel to exotic places and see amazing things. His adventure was relationship. Muntz was the opposite: He went to the ends of the earth but he never actually had any relationship except for this weird, twisted one of himself and his dogs, which also kind of explains how he�s able to do all the things he's done, et cetera. So that was our buy-in [to] getting the dogs worked in. I also think what makes it convincing all the way around is your casting of the voices. This is really a movie about these people living through these characters. Of course, when we cast the film we'd already designed the characters. And you never had actors in mind as you were designing them? Well, we had a bunch of actors in mind. 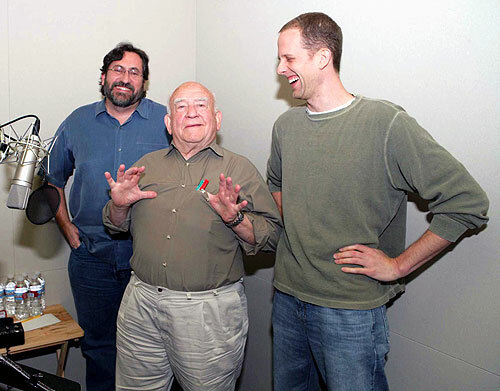 With this one, of course, Ed Asner rose to the top of the list pretty quickly. But then what happens is when we cast we start to be informed by the actor. So the writing of the character changes, the way in which they speak, the words they use, that all changes, and we try to basically write to the strength of the actor. That certainly was the case of the kid. His name was Jordan Nagai. He�s not an actor, never done stuff before. What most animation does is they get an older woman who is an actor, who can kind of sound like a kid, like with [Nancy Cartwright's voicing of] Bart Simpson. But we really wanted to have that authenticity here and so we found this kid who just sounded very sweet and real and truthful. We rewrote the part; it was originally a little more hyper and bouncing-off-the-walls, and Jordan is a much more reserved kid, so we adjusted that character and slid it more to play to his strengths. Talk about the wife and the little girl, or the little girl becoming the wife. The young girl was my daughter. I didn't realize that you actually used kids on some voices. To use kids is really a challenge in an animated film. I credit the editors, [led by] Kevin [Nolting]. I think they're as much to credit for these performances as some of these actors, because a lot of times what happens � not in the case of Plummer or Asner, of course, this is more when you�re working with kids � but a lot of times you get just these little snippets where right there for three words they sounded believable and then they went off the rails, but then this other track here, if we cut that together�. So it ends up this Frankenstein mess which sounds seamless and natural, but that's the strength of the editors. Christopher Plummer is the perfect guy to play Muntz. Was that because you saw The Sound of Music? No. 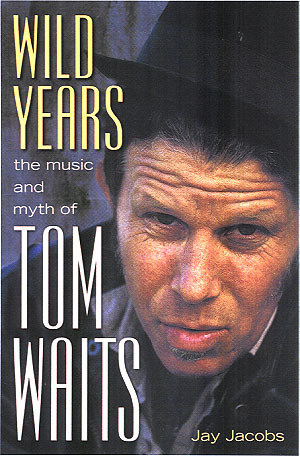 Of course I remembered him from that, but there was another movie where he�s like this rugged adventurer kind of guy. When we designed the character we were thinking of him a little bit more like Ernest Hemingway; more gregarious and loud. When we cast Plummer he gained a little more refinement and education, and just colored that character a little bit. Had he done animation before this? Quite a bit. In fact, he�s done just about everything. We were recording and he did something, and the engineer said, �Mr. Plummer, can you stay closer to the mic? You went off mic a little,� and he said, �Oh, no, that was on purpose; it was a trick I learned from Orson Welles in radio. He would move back away to give a proximity,� and he was right. This guy has done everything; he knows his craft. The dog must have been fun to cast. Dug was Bob Peterson, who, of course, wrote the part, but he said he was channeling a dog that he used to have. This is a pretty trim voice cast for an animated film. That was by design, too. You're making a point of the strength of the performance by the actor. The other thing that kind of is invisible to the audience is the strength of the animation. When you really look at it this film doesn't have a ton of dialog compared to a lot of films. These animators are so talented and they've built up their skills on over ten films now. I think the dog had more dialogue than a lot of the other characters. Carl is a man of few words. 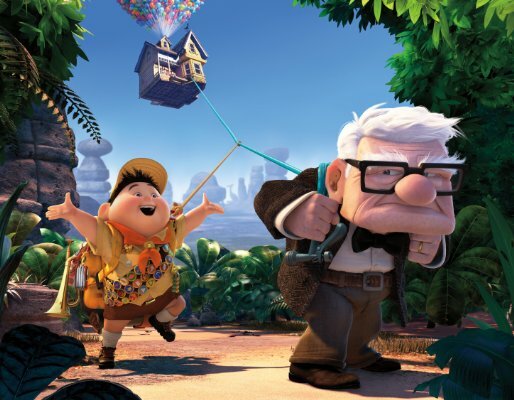 Do you have your own favorite moments in Up? Yeah, I do. My favorite is probably the sequence in the beginning we called �Married Life.� It is four-and-a-half minutes of their life together. That was a lot of fun to do but kind of nerve-wracking, too, because you have to be careful when you're presenting something like that that you don't top the schmaltz-o-meter. But it seems to have succeeded, so I'm very proud of that. There's another scene at the end where Carl gets finally inside the house, and he sits down and he goes to look through the adventure book and finds that those blank pages are full of pictures of the two of them. I'm proud of that one, too, for much the same reason, where it's the juxtaposition of the images and Carl's face. Between that and the acting, that scene I feel like works quite well, and it's all done without dialogue. #2 � 2009 Deborah Coleman. Courtesy of Walt Disney Pictures. All rights reserved. #3 � 2009. Courtesy of Walt Disney Pictures. All rights reserved. #4 � 2009. Courtesy of Walt Disney Pictures. All rights reserved.